View looking east from Megiddo across the Jezreel Valley towards Mount Tabor. The valley is visible in foreground. The photo was taken on 1 June, but please remember that the Israelis irrigate the valley and thus portions of it are greener than they would be in its natural state before irrigation began to be used. 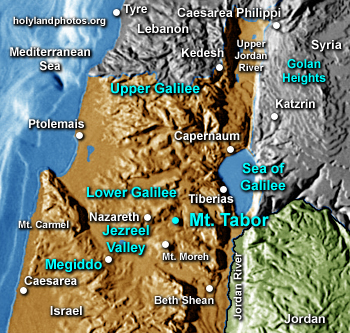 On the horizon, from left to right (north to south) are: the hills of Lower Galilee (left), Mount Tabor (center), and the northern slope of the Hill of Moreh on the far right (south) of the image. Image from the Zondervan Atlas of the Bible p. 39.